Some work in progress art work for next album | . astrakan project . Last Astrakan Project album (2012) was the first album ever I used my art work for. With the exception of Yann’s portrait, I did not specifically create the paintings for the album, but once they were finished (they were created between March and June 2012 whilst the album was to be released in September), there was absolutely no doubt in our minds they belonged to the album. For our upcoming album, I had no idea so far. Absolutely zero! I even hadn’t been drawing much lately because I kind of wanted to get first an idea of what to paint… for the album! Prob. 17-18th C. Norwegian Sami People Drum. During rituals a ring was moved around on the drum membrane. 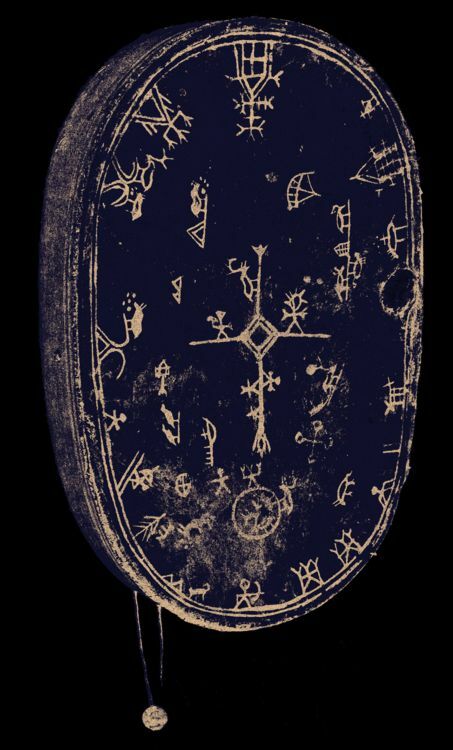 Predictions and conclusions were made based on rune itself and the path that the ring took in selecting it. While composing music we often get into the same inspiration process, if we try to pull it too hard, nothing really happens, when we let go off the pressure about “this needs to be done”, then only ideas start to flow. …best ideas come to us – if we allow them to. ← Passing along our Music passion to next generation!